Crikey. Section 44i might take out another two Ministers. 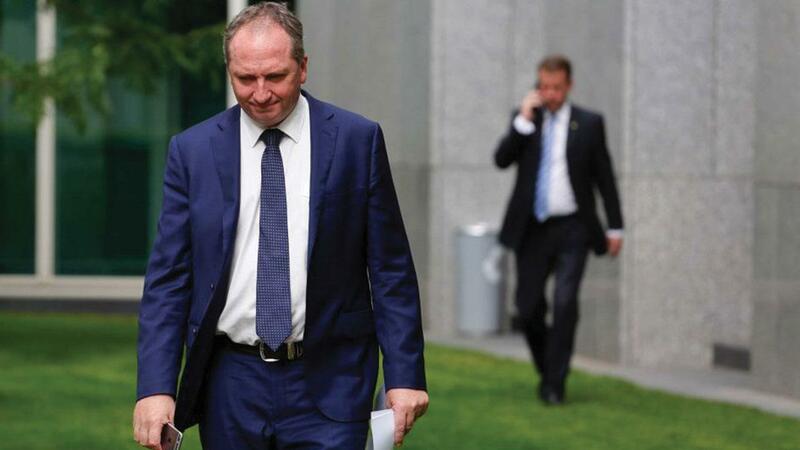 On Monday Deputy PM Barnaby Joyce got up in parliament and announced that he was possibly a New Zealand citizen. Then in the final few minutes of Senate sitting time last night Fiona Nash announced that she is a citizen of the United Kingdom. Barnaby Joyce’s father was born in New Zealand and moved to Australia in 1947 as a young adult. He married an Australian woman and had his family. Young Barnaby was born in Tamworth in 1967. Under New Zealand law anyone born to a New Zealand parent between 1949 and 1978 is a New Zealand citizen by descent. Barnaby Joyce did not have to apply for or register for New Zealand citizenship, it is an automatic process. A Confirmation of New Zealand Citizenship by Descent form can be filled out for these automatic citizens to gain a New Zealand passport. Fiona Nash was born in Sydney to a Scottish born father. It has been stated that this provides her with citizenship of the UK by descent. What will need to be established is whether this is an automatic process, like in Barnaby Joyce’s case, or whether there is an application process. Preliminary advice from the British Home Office is that she is automatically a dual citizen. There have been rumours that the Matt Canavan case was sent to the High Court because there was an MP in a similar position. As such, the media have been researching and looking into the background of every elected member of Parliament. A blogger raised the possibility of Barnaby Joyce being a dual citizen back in July, Patricia Karvelas asked him about this on Sky News a few weeks ago and Fairfax had been chasing the New Zealand Government for confirmation about his citizenship status for some time. In response to these queries the New Zealand High Commission contacted Mr Joyce last Thursday to let him know that he was a citizen of New Zealand. What if you were validly elected because you were ignorant of your dual citizenship at the time, but then became aware of it? Would you lose your seat as soon as you found out? The same test might apply for Fiona Nash. It has been reported that she knew since at least Monday that she was possibly a dual citizen. She sat and voted in the Senate for four days this week. Barnaby Joyce’s case has now been referred to the High Court sitting as the Court of Disputed Returns to determine whether New Zealand citizenship by descent is enough to cause him to be incapable of being chosen to sit in Parliament. (i) is under any acknowledgment of allegiance, obedience, or adherence to a foreign power, or is a subject or a citizen or entitled to the rights or privileges of a subject or a citizen of a foreign power…. ….shall be incapable of being chosen or of sitting as a senator or a member of the House of Representatives. A Court hearing has been scheduled for Thursday next week and will include Barnaby Joyce, Matt Canavan, Malcolm Roberts, Scott Ludlam and Larissa Waters. It is unclear whether the Fiona Nash issue will be dealt with at the same hearing. The Senate may be required to meet again to officially refer her case to the High Court Sitting as the Court of Disputed Returns. (i) becomes subject to any of the disabilities mentioned in the last preceding section…. Whenever a vacancy happens in the House of Representatives, the Speaker shall issue his writ for the election of a new member, or if there is no Speaker or if he is absent from the Commonwealth the Governor‑General in Council may issue the writ. Barnaby Joyce is the Member for New England in New South Wales. Before he was elected to this seat in 2013, it was held by Independent Tony Windsor for many years. It is possible that Mr Windsor may run for the seat of New England in a potential byelection. If he were to win in a byelection, the Government would lose their majority in the House of Representatives. On the other hand, Barnaby Joyce has now renounced his New Zealand citizenship and will likely run for the seat. He might be re-elected. In the meantime, if he is found to be disqualified and removed from the House we would have a hung Parliament. We now have six members of the Parliament with possible section 44i constitutional problems. This includes three Ministers. Two of them have stated that they will not stand aside while the High Court decides whether they were incapable of being chosen to sit in the Parliament. Is there something that should be done to fix all this up? The Parliament sits at the Queen’s pleasure and the royal prerogative can be used to end a session of Parliament. If the Prime Minister asks the Governor-General prorogued the Parliament it may be viewed that the Government has conceded that we are in a constitutional crisis. Independent Senator Derryn Hinch and the Greens Party are calling for an independent audit into all MPs citizenships. This would involve an independent body examining all MP and Senators backgrounds to ensure that everyone that was elected in July last year is entitled to sit in the Parliament. In the meantime, it seems that reporters are already conducting this in the place of the independent body. If we did want to change the Constitution to allow dual citizens to sit in the Parliament we would need to hold a referendum. It would be up to the people to decide whether they would like to allow dual citizens to represent them in the Parliament. The mechanism to alter the Constitution is stipulated in section 128 of the Constitution. This requires that more than half of Australians overall and a majority in at least four states to vote yes for a change to occur. Our Executive Government is made up from the members of Parliament. This is an important aspect of responsible government. It means the Ministers must be responsible to the parliament for their actions and laws have to be passed by both Houses of Parliament for the administration of their portfolios. It also means that they are elected by the people and the people can decide to re-elect a Minister to Parliament or not. But above anything else, a Minister’s loyalty to Australia is very important. Hypothetically, if a dual Australian New Zealand citizen is the Agricultural Minister how can we know if he or she is working in Australia’s or New Zealand’s interest? What about a Defence Minister that was a dual US and Australian citizen? Where would that Ministers loyalties lie? A dual Foreign Affairs Minister in charge of the international aid budget? A dual Immigration Minister who makes decisions on who is allowed into Australia? It goes on. The High Court is the branch of Government responsible for interpreting the Constitution. In the cases of Matt Canavan, Malcolm Roberts, Barnaby Joyce, Fiona Nash, Larissa Waters and Scott Ludlam, they will be sitting as the Court of Disputed Returns. Some people are saying that foreign citizenship by descent might stretch the meaning of section 44i of the Constitution. We wrote about this a few weeks ago. The question we asked was, can you own an allegiance to a foreign power if you don’t know that you’re a citizen of that country? The Prime Minister has stated that Government has legal advice from the Solicitor-General that these three National’s will be safe from disqualification. This advice has not been made available to the public or the Parliament. Other people are saying it’s pretty clear that all six of these parliamentarians have breached the Constitution. The separation of power will ensure that the High Court interprets the Constitution and decides the next steps in the process. In these cases the Solicitor-General will make arguments on behalf of the Government (who has advised that the three National’s shouldn’t be disqualified) and Matt Canavan, Malcolm Roberts, Barnaby Joyce and Fiona Nash will be represented by their own lawyers in the Court. These lawyers will also argue that their clients should not be disqualified. So perhaps there will be no argument presented to the High Court that these Parliamentarians should be disqualified. On top of this National Party MP David Gillespie has been referred to the Court due to a potential section 44v breach (click here to read more about that). And just last night we found out that National Senator Barry O’Sullivan might have a section 44v problem. He is a shareholder of a family business that has a contract for Federal Government work. He doesn’t think he has a problem, but Constitutional experts last night stated that he might be in a bit of trouble. If British citizenship is automatic if you have a parent from the UK, how many other parliamentarians are going to be caught up in this? It was reported today that Nick Xenophon is checking with the British Home Office about his status (It seems his Dad may have been a British citizen). He has stated that he will publically release all the advice he receives from the British Home Office. We are in a very unusual period.